A counter offer is a viable tool in the salary negotiation toolkit for both the employer and the job candidate. The counter offer is used to keep employee salaries within the market range while not overpaying for positions by the employer. 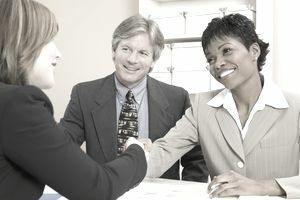 The counter offer is used to go after the highest possible salary for the candidate. When you negotiate a salary with a job candidate, you can expect that he or she will make a counteroffer to your first job offer. If the counteroffer made by the prospective employee seems reasonable, most employers will counter with their own revised offer. Or, the employer has the option to accept the prospect's counteroffer. The counter-offer is usually a request by your candidate for more compensation than you offered. But, the counteroffer can ask for additional benefits and perks such as more time off than offered, too. The best approach to salary negotiation is to verbally agree with the candidate about the details of the employment offer. Then, the actual job offer becomes a formality that confirms the details of the agreement in writing. This approach allows the employer to quickly wrap up negotiations without a number of counteroffers going back and forth with the prospective employee. This causes less stress for every party and usually enables the employer to wrap up the details of the employment quickly. Who Makes a Counter Offer? People who are interviewing for more senior positions with your organization are most likely to counter your original offer with a counteroffer. For example, a senior applicant may have accumulated eligibility for four weeks of vacation in his or her current employment and does not wish to take a step backward to settle for the two weeks you offered. Senior employees are also more likely to negotiate issues such as severance packages in case the employment relationship is unsuccessful. If this was not covered in your initial job offer, you can count on it appearing in the prospect's counteroffer. Less senior employees are more likely to accept your original offer without making a counteroffer. They realize that you may have less flexibility with beginning to mid-career positions. And, that is the reality of employment. Human Resources will not risk harming the morale of current, successful employees by negotiating more time off, a salary outside of the accepted market range for the position, or additional perks and benefits that are not provided for other employees. (You organization may have to make an occasional market-based salary adjustment for existing employees if the going rates for beginning employees change substantially in the marketplace. On any job offer, the employer sets a deadline to ensure that salary negotiations take place in a short period of time. The goal is to have the new employee start work expeditiously. Or, the employer realizes that they will be unable to reach an agreement with the prospective employee and can contact other qualified candidates before they become unavailable in the job market. During the salary negotiation and while exchanging counter offers, an employer has the opportunity to continue to build a positive relationship with the prospective employee. The goal is to ensure that the new employee starts his or her new job in a forward-looking, positive frame of mind. Successful salary negotiations result in an employment contract that is acceptable to both the employer and the new employee. Counter offer flexibility depends on the position for which you are hiring the prospective employee. Very similar to the salary negotiation as a whole, the employer's flexibility in making a counteroffer depends on a number of factors. Flexibility in a counter offer generally increases with the level of the position within your organization. Executives and senior employees negotiate for a range of executive compensation requirements around salary, benefits, and perquisites or perks. They are more likely to continue the negotiation until they have negotiated all of the changes to the standard benefits and perks that they can. A senior level salary negotiation is frustrating on occasion. economic conditions in your industry. Counter offer viability is also affected by company-specific factors such as the existing salary range for comparable jobs, your organization's culture, your pay philosophy, and your promotion practices. What Exactly Is a Job Offer? How Is Executive Compensation Different from Other Employees? Why Might an Employer Choose to Pay a Signing Bonus? What Pay Raise Can You Expect From Your Employer? Understanding Your Job Offer: What Is Total Compensation?